← Mezza Norte Moves to Trinoma This May! While looking for healthy food items at Robinsons Supermarket one month ago, I saw somebody getting Vitasoy Calci-Plus from the shelf. Curious, I picked a carton of this soya drink and checked the label. 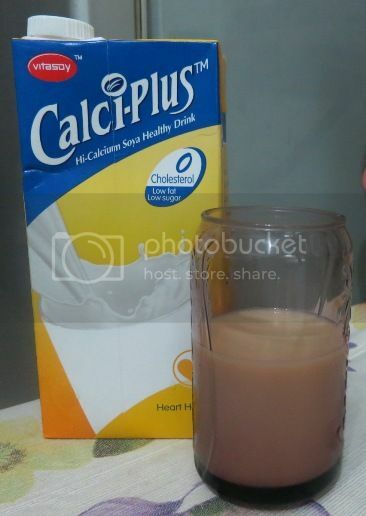 It’s a high-calcium soya health drink because it has 170mg calcium. It is also low in fat, low in sugar and has zero cholesterol. According to their website, it’s also lactose-free. What I learned about this product was enough to convince me to make a purchase. I was glad I chose the Oat Flavor because I really like it; the little boy enjoys it, too! It looks like chocolate milk but lighter in color and thinner in consistency; it’s also not too sweet. This entry was posted in Oat Flavor, Vitasoy Calci-Plus. Bookmark the permalink.